I don't think there is one yet, so here it goes. I love these little buggers and got ready for them today. anyone have a link to last years? I want to make this one even longer! I got a question What size works hole,width,length,etc. works best for you? 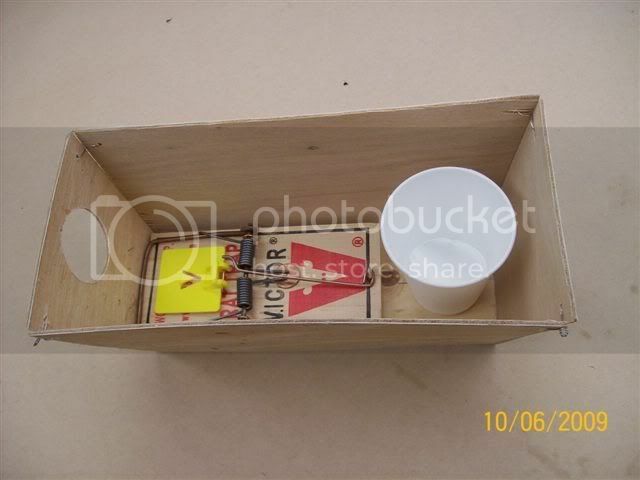 Is there an easier way to set a rat trap? I'm afraid to lol I always get hit. 2poor If you don't mind me asking where do you get those cedar boards and for how much? C'mon guys help us out! I know there are tons of weaselers out there. Lets post plenty of pics too! I have never targeted weasels and would like to try to trap some this year, what type of habitat do they live in, and what type of sets do you use? 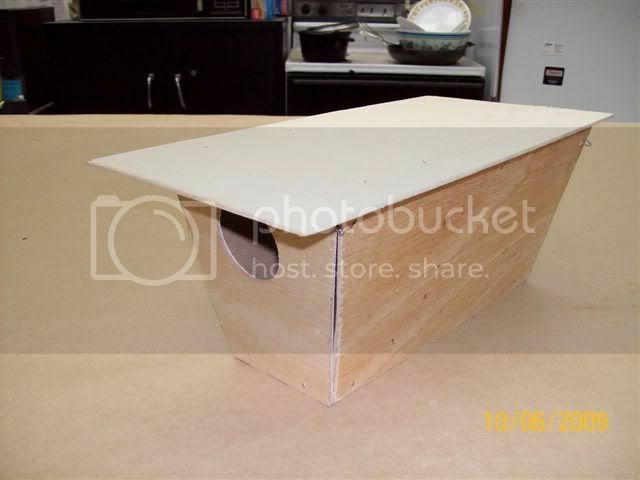 what should the dimentions of a weasel box be? I make mine twelve inches long six inches wide and six inches high but I have not caught one yet so I was wondering what others were using. My dimensions are the same as 2poor's if I remember correctly. What do you guys use to make your holes and how big? How hig? Here is an idea I am working on this year. 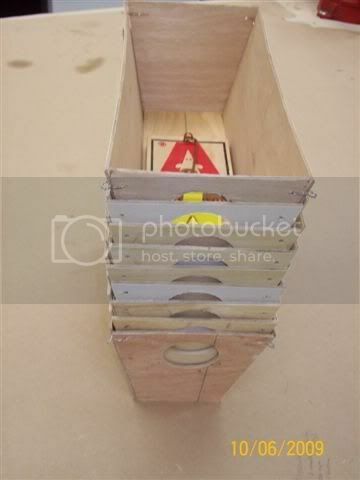 Wanted to go after the weasels without using up my steel traps, so I came up with a plan to make some stacking boxes using rat traps. I use a snowmachine and sled on my line so portability is important. 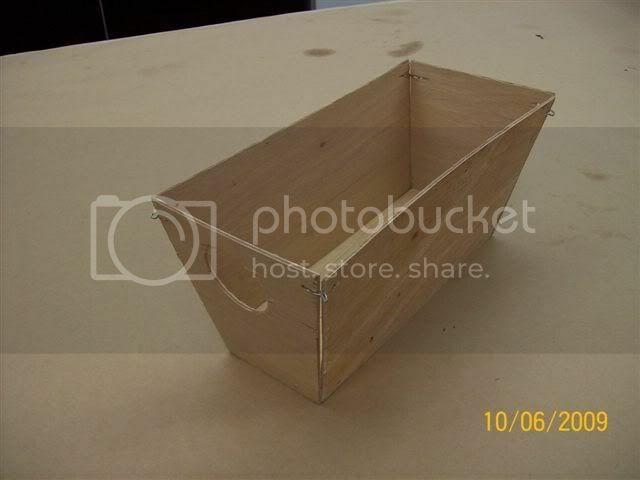 The wood boxes on last years' epic thread and elsewhere are works of art, but kind of bulky. Sides and ends are 1/8" lauan plywood, bottom is 1x4. Lid is also 1/8". Small blocks nailed to the inside of the lid keep it centered, sorry you cant see it in the pic. A rock or chunk of wood keeps it from blowing away (usually lol) Wire could also be used. Used light wire to keep the sides attached to each other. Easier than blocks of wood because of all the funky angles. Hole is 2" diameter, centered 4" from the bottom. Got a lot of ideas from this site, thanks guys! So far have only caught 5, but it appears that when a weasel goes in, he'll be there when you come back. Having a lot of problems with voles, mice and shrews setting off the trap first though. Am working on a tension adjustable trigger for the M-320 trap pictured, hopefully that will let the small guys walk and catch the ermine. Last edited by Swamp Walker; 12/08/09 01:36 PM. Nice idea. Might have to try that. I need some of those rat traps instead of mine. They look easier to set! I put out 10 boxes yesterday and caught 3 today. I really hate skinning those little buggers. Last edited by 160user; 12/08/09 05:51 PM. Nice. I put out some today. 20 boxes on sunday, checked today and had 5 weasels and 4 set off traps....either a small mink or a longtail. still no luck,had to chip out 3 that where frozen in, one was half full of 2poors favorite ice. I thought small mink were all you caught. Well, that and suicidal, bling and deaf fisher. skunk24, they are WAY easier to set. I got mine from doyourownpestcontrol.com, make sure they give you flat rate shipping though. You may be able to get them locally more easily than we can here in Alaska though. They were just a touch over $2.00 each, delivered. Make sure you get the "M-320 Professional" style. They have a firm and soft setting, but like I said before I am working on a mod to make them fire at about 3 oz, should exclude rodents but snap the weasels. Am I going to say this? I got something stealing some bait yesterday. I want to check today. If we get off this 2hr delay and close I can or I might have to wait until after school.